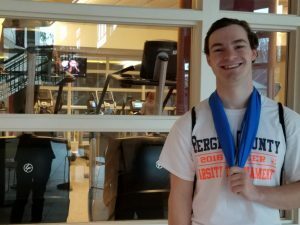 It’s early for Ethan Semendinger ’21 to be at Kirby Sports Center. He typically exercises from 4 to 5 p.m. But the neuroscience major from Wyckoff, N.J., set his alarm for 6:40 a.m. to get a hit of endorphins before his 9:30 a.m. chemistry class. It’s dreary outside, making it tempting to hit snooze and roll back over, but Semendinger didn’t struggle. Recreation Services’ Ted Waxmonsky, who is greeting the morning regulars, says Semendinger picked an ideal time to visit Kirby. Semendinger, who would like to go to medical school and specialize in sports medicine, thinks the new early-bird workout routine will stick. The real test will be tomorrow—when he has an 8 a.m. class.